In our newsletter of 31/8/2018 we committed to regular updates and so here is what has been happening since. One of the hot topics amongst fans over the last couple of weeks has been the potential for Freeman Street to be the location for the new stadium. After the frustration of the failed Great Coates project it is our understanding that the council highlighted Peaks Parkway (PP) as a potential alternative site and on the club’s own assessment this became their preference. As part of the feasibility the council quite rightly wanted to do their own assessment and as a result they commissioned and paid for two reports. First of all, they wanted to understand the social and economic benefit of actually having a new community stadium in the Town. This was very positive and so the next assessment was on the basis that it is the right thing to do then where should it be? This assessment was based on a number of factors such as site availability, condition, size, location, public transport, highways access, walking catchment etc. The conclusion of the study was that PP was the most suitable site and at that time Freeman St didn’t even make the shortlist based on size, complexity of ownership and timescale. Some have argued that the study was skewed towards PP based on the size criteria and that the stadium and enabling can be separate, but we do not entirely agree with that view. The facilities such as hotel, conference, restaurants, sports and education etc together with the sport and leisure facilities planned by Extreme would need to be part of the stadium site. Housing could potentially be elsewhere depending on land availability, ownership etc. This leaves the community/training pitches which ideally would be on the same site, and that was the assumption the criteria, but we agree they could potentially be separate and if that was the case as a suggestion we think Kings George/Clee Fields would be a good site and should be explored. The situation as we understand it now is that the council have recently suggested to the club that Freeman St should be reviewed again on the back of regeneration. This is obviously at a very early stage and it would seem sensible to us that while that work is being undertaken the PP project is still there as an option. Also, it appears to us that this fundamentally changes the project from something that was a football club led project with council support to something that now has to be led and delivered by the council. We don’t particularly have a problem with that and would welcome the council’s commitment. As we have already said we absolutely support the need for a new community stadium, but we are very open-minded regarding location. We have always backed PP because as far as we can see that is the best site where a club led project could be delivered and we still believe it is a good site, although we do appreciate fans views on that are mixed. We have always thought that if the fans had something more tangible to look at in terms of a worked up model or similar then it would get more support and understanding. The Freeman St idea could be very exciting but as we have already said it is very early days and there are a whole range of questions that need answering particularly in relation to financing. We really need asap a public statement from the council and club to confirm where we are at with project and realistic time frames. We will be pushing for this as a matter of urgency. One thing seems certain and that is we will still be at Blundell Park for some time to come and that raises concerns about upkeep/improvement projects and the cost thereof. We know there are major works needed on the floodlights as well as a big list of other things such as toilets and disabled facilities. The costs and potential funding assistance for these are currently being assessed. As we have previously reported we have been working with Supporters Direct (SD) and the club to look at how we work together. The output of this will be a memorandum of understanding (MOU) which will be a public document available on both the Trust and Club’s website. This was discussed at last week’s club board meeting and the final document is now being put together. Obviously, the document will contain the detail but what we can say is that within MOU agreement our board place is not conditional. As the majority of our income comes from the bars it is only right that we commit to supporting the club but this will be used on agreed projects and communicated to the fans accordingly. The agreement will also cover protection on what we would call red line issues such as club badge, name, strip, stadium use and “B” teams participation in the league structure. On both our parts there is a commitment to improved communication and engagement. We think this is a positive step forward and hopefully when you see the full document you will agree. Thanks to those who came down to the 140yr exhibition yesterday and we know from the positive feedback that those who came really enjoyed it. We acknowledge that it was put on at short notice, and publicity could have been better, so we have decided to do it again a week on Thursday (27th) from 5pm to 9pm. We may be more restricted in terms of access to boardroom etc depending on what we can agree but there will still be plenty to look at. We are going to try and get some players along as well. A reminder that the celebrations continue at the Wellington Arms this Thursday (20th September). The pub will have an open buffet all day and will doing fundraising for the YDA which they have already started with a kind donation of £150. They have lots of memorabilia on show and Michael Jolley and some of the players will be there at 6pm. A formal notice will be issued but the date for our AGM will be Wednesday 24th October. As ever we are always looking for people with the time and enthusiasm to get involved either as a full board member or as a willing helper. We are particularly in need of help in the following area. Communication – Website, social media, e-mailing etc. We also need individuals with the ability to pick and run with projects and see them through. In addition, as think about succession planning for the officer roles and board representative we need individuals with the right leadership and business skills. If you fancy getting involved but would like to know more then, please just contact us at enquiries@marinerstrust.co.uk. We have a fantastic opportunity for 16 of our Junior members to play on the pitch at Blundell Park at the last home game of the season next week. The atmosphere is sure to be amazing, and you could have chance to soak it all up as part of our teams to play at half time. Not only that, but thanks to GTSET you will have a tour of the grounds, and possibly meet a few of the players! We will contact the winners next Thursday, 26th April. You must be available on Saturday 28th April to meet at Blundell Park at 12 noon. The competition is open to Junior Mariners with a current, active membership only, and they must be aged between 5 & 12. Good Luck everyone & UTM!!!!!! 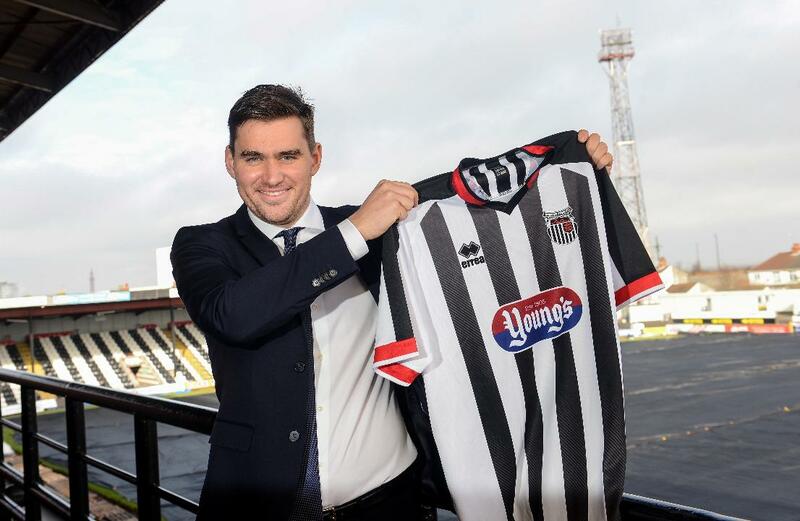 We are delighted that Michael Jolley has agreed to join us in the Trust Bar on Thursday, 22nd March. We will open at 6.30pm for your chance to meet the new gaffer, have photos taken etc, and then have an informal Q&A session from 7.30pm onwards. Entry will be just £3.50 and will include a free drink from the bar. Children are welcome with an adult and can enter free of charge. Tickets are available HERE or on the door on the night. 2018 Fans Survey – The Results! We are delighted to be able to share with everyone the results of the 2018 Fans Survey. We understand that there will probably be a lot of questions and comments on the results, and we welcome these by email to enquiries@marinerstrust.co.uk or via our Facebook & Twitter inbox messages. Thank you all for your participation in the survey. WIN!!! Signed 2018 Home Shirt! 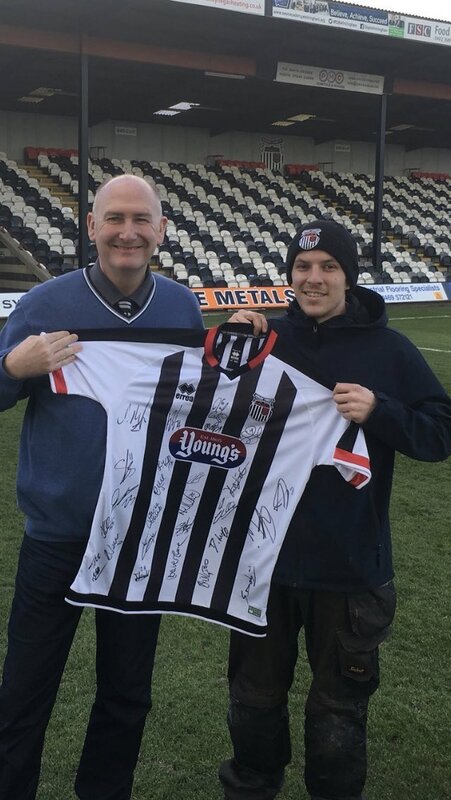 GTFC fan Neil Jackson was lucky enough to win this fantastic signed 2018 home shirt. He has very kindly offered to raffle it with all proceeds going to the Disabled Supporters Club. The Disabled Supporters Club is very close to Neil’s heart as he used to travel with them with his dad in the late 80s & early 90s, so he knows first hand that the work they do ensuring our Disabled fans can attend as many games as possible is essential to a lot of people. If you’d like to be in with a chance of winning, simply make a donation to via our website HERE. It is just £1 and you can enter as many times as you like! Neil hopes to raise at least £50, so please dig deep and be generous. A winner will be drawn at random on 23rd February. 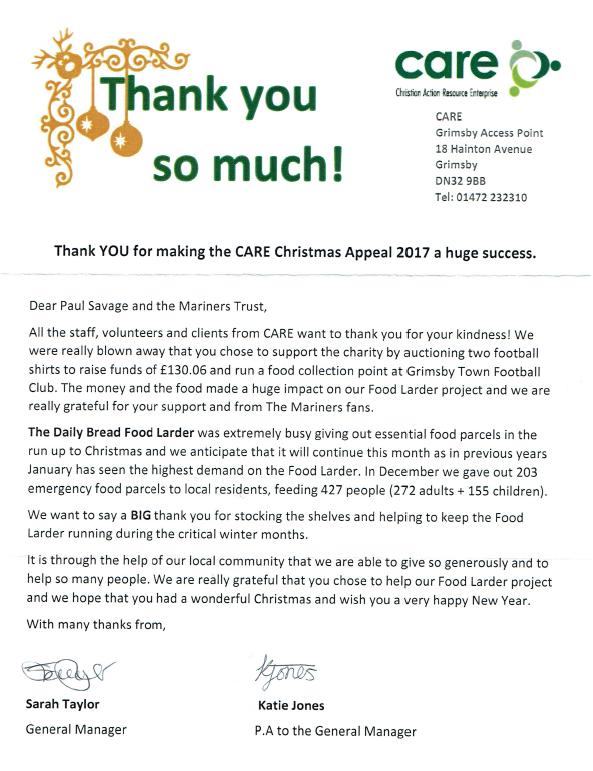 We were delighted to receive this letter from CARE yesterday, following our collection for the food bank before Christmas. A huge Thank you to everyone who supported this! Since launching the survey just 2 weeks ago, we have had an amazing response with over 500 replies online and many more completed in the bars around the ground. In the initial week, we saw over 480 responses come in and it has naturally now tailed off to just one or two responses per day. The Trust recognise that there is a serious need for a clear direction for the future and this was always the main aim of the survey. The fans are clearly telling us via social media that they are in need of this sooner rather than later. We have therefore made the decision to bring the closing date of the survey forward to Sunday, 11th February 2018. Until then, you can still complete online HERE or by emailing us at enquiries@marinerstrust.co.uk. We have also made the form available HERE so you can print it if you would prefer – then just pop it in an envelope and post it to the Trust at Blundell Park or pop it into the ticket office. We still want as many responses as possible. There will be a lot of work to do analysing the responses and some important decisions made on what happens next with the Trust. This really is your chance to tell us what you want and how you feel. Please, if you have not already done so, complete your survey today! Due to a fundamental disagreement regarding the future direction of the Mariners Trust, Paul Savage has resigned both as Chair and from the Trust board with immediate effect. Vice Chair, Alan Rutter, will take up the position of Chair in the interim.The Mariners Trust would like to thank Paul for all of his hard work during his time as a board member and wish him well for the future.